Released in 2014 on PC and Windows Phone, Age of Empires: Castle Siege is now available for free download on Google Play, where it is also compatible with Android smartphones and tablets. 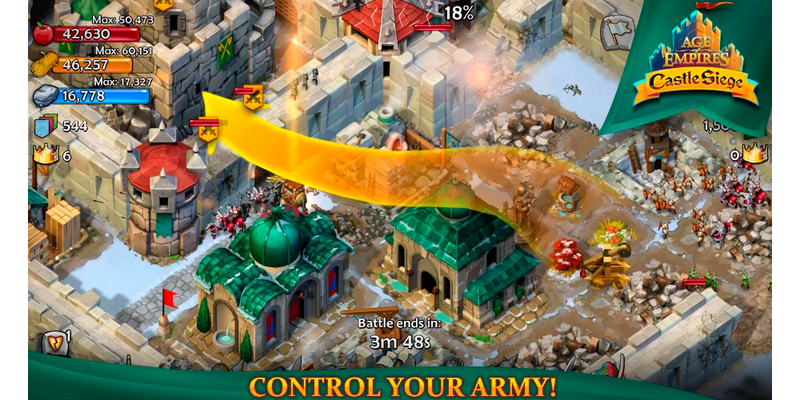 Developed by Smoking Gun Interactive under license from Microsoft Games Studios, Castle Siege is a strategy game set in the universe of Age of Empires, one of the most beloved franchises by players, and not only by lovers of the strategy itself. From the point of view of gameplay, it is not a strategy game in the traditional mode in real time. It can be compared to Clash of Clans, since the main objective is to build an empire, make it prosper and at the same time try to defeat other empires and enemies. Age of Empires: Castle Siege invites you to guide your Empire through the Middle Ages on your Android device. Choose one of the civilizations, including Britons, Teutons and Kievites. Upgrade your stronghold, strengthen your walls and guards defensive troops to protect you from the valves. Train an army to plunder other cities and takes command of the battle to dismantle the defenses of the enemy. As you progress in the game and pass the time, you will develop more and new technologies that can be used for both social and military advancement. It is, after all, a game that covers a period of human history in which empires were the order of the day (also their uprisings and falls). Age of Empires: Castle Siege is available in freemium mode on the Play Store (free download but with app purchases up to 69.99 euros). If you are interested, below you will find the link for the download.